The lovely Showgirl tangle pattern is a variation on Florida tangler Vicki Bassett’s Biscus, also added today. These are her first tangles on the site. Vicki writes that Showgirl “has the appearance of a feather boa. I named it Showgirl because I had just returned from Las Vegas and it seemed fun & fitting. 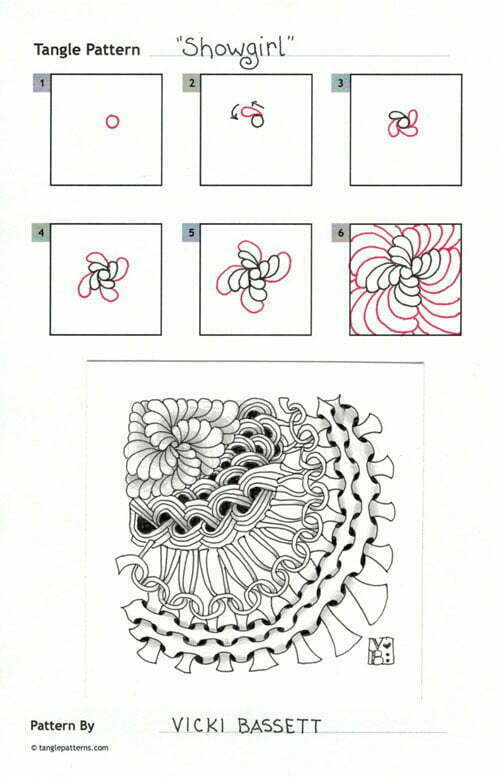 Vicki illustrates the steps for for drawing her Showgirl tangle below. 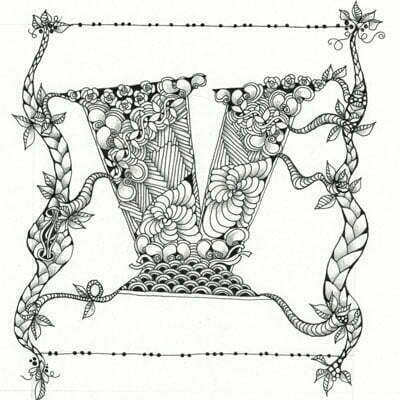 Vicki also sent along this beautiful Zentangle-inspired piece featuring Showgirl for us to enjoy. Really fun tangle Vicki!! I can’t wait to try it when I get a minute. It’s got all the elements of my favorite go-to tangles! Thanks for sharing it with us! I have never tried this but really want to. Just looks so hard to do. Love this one and want to try but know I should start with something easier. I encourage you to just go for it, Susan. Any tangle is easy to do if you take your time and focus, and remember that “anything is possible, one stroke at a time”™. Practice on a spare piece of paper a few times until you get the hang of it. Linda is quite right, Susan. I fell in love with the Mooka tangle, but had so much trouble drawing a decent one. I have filled sheets and sheets practicing Mooka, and now I can draw decent and better Mooka. I monotangled a tile with Mooka, and I call it Mooka Madness. I love it. Now, I am having to do the same with Aquafleur. I love the Christmas Zentangle that Carole Ohl and learned it was done with Aquafleur. Aquafleur was recently published on the Internet by Maria and Rick. I was so excited! But I am having trouble with it, so I am now practicing and practicing it. I wonder if I’ll use as much paper as I did getting proficient with Mooka. If you turn your tile clockwise after each stroke, it’s really very simple. After 4 strokes of the same size, increase the size of the next row and keep going! You’ll see how simple it is. Ooh!! This tangle looks fun. I’ll be having a go at this one soon. Lovely pattern Vicki. I’m really intrigued by the idea of tangles on photos Do you have any examples online? Lyndel, I have nothing online but eventually I’ll set up a website. Someday I’ll have the time to maintain a site! Thanks Vicki, we could all use some more time couldn’t we, especially once we start tangling ????. Thanks Linda, Anje’s example is amazing. I know of Tangie Baxter from the scrapbooking world, I’ll certainly follow up in that direction. I like the way this flows. It seems to draw your eye from this pattern into the next. Very nice! I am anxious to try it out. Thank you for sharing.. This looks like fun! Puffy expanding things. 🙂 I’ll try it soon. This is a lovely pattern – let me at it! Awesome tangle Vicki! Got the email notice & had to jump on over, the name really intrigued me! I love tangles where the name just ‘fits’ the tangle…you expect the ‘showgirl’ to start doing her feather dance! Lol! Can’t wait to add this to my favs, great instruction and beautiful examples of your work! Thanks!!! Thanks to you and all the others for the nice compliments.I kind of had the feeling that other tanglers would love this one! I love your Tangle! I am also from Land O’ Lakes! And everyone always says ” oh, is that where they make the butter?” it drives me crazy! You do wonderful work, thank you!